All of us in the library were sad to hear of the passing of Fred Sturm, Professor of Music and Director of Jazz Studies and Improvisational Music. What Music Librarian Antoinette Powell remembers most about him is his sense of humor. II. Approval of April 21, 2009 minutes – Black Bart threatened to shoot us all dead if we didn’t approve the gol-danged things. III. Admission report Dances With Wolves Ament and his posse rounded up 87 flea bitten no good mule headed varmints. IV. Swine Flu update Black Bart said we gotta stop takin’ baths together on Saturday nights, stop steppin’ in cowpies, an’ quit chewin’ tobacckie or Doc Holliday’s gonna shoot us all dead. V. Commencement Concert length Wyatt Earp Stannard’s tired of all that catterwallin’ and lollygaggin’ and said he’d hang anybody that dances on stage fer more’n 8 minutes. VI. Signage on College Avenue You tenderfoots oughta be doin’ what I got planned down in Texas – Ah’m plannin’ to brand little dogies with promo like “Texas Tech’s OK Chorale 2-Night! !” and stampede through downtown Lubbock. Moooo!! 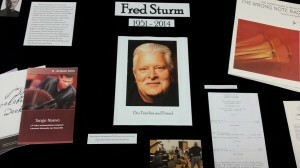 To read more stories, or to share your own, the university has set up a webpage dedicated to Professor Sturm remembrances. We’ve also set up a display in the library highlighting some of his accomplishments. As part of a project for an independent study, graduating senior Dakota Williams has put together a display on the library’s first floor. Titled “A Brief History of the Lawrence Conservatory of Music,” the display chronicles the extensive history of the Conservatory, exploring its different ensembles, noteworthy deans and professors, and the different buildings that have housed the Conservatory. With aid of the Lawrence University Archives, Williams has assembled an intriguing display exploring some of the rich history of Lawrence. The project is on display in the cases on the first floor of the library, and will be up until June 13th.